Lee & Low Books, 9781600602535, 28pp. Estela is excited. This is her first time at Swap Meet, and she is looking forward to selling her music box to earn money for folk dancing lessons at the Ballet Folklorico. As Estela waits for customers, a strong wind suddenly sends everything flying. Estela rushes to help a woman selling flowers across the way, but she is too late. All the flowers are gone Estela decides on a simple act of compassion and generosity, which brings her the gift of friendship and a delightful surprise. 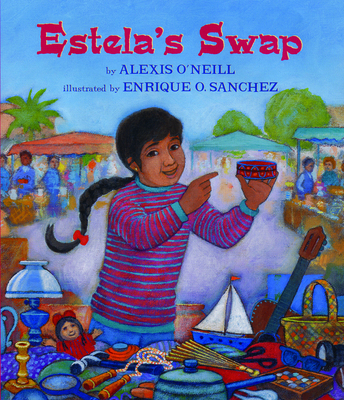 Estela's Swap is sure to resonate with all children who have a special wish and work hard to make it come true. Readers will discover the joy of giving -- and receiving, too.